'A' Coy, 2nd Battalion, The Worcestershire Regiment, 5th Brigade, 2nd Division, B.E.F. William Morris, born in the parish of St Stephens, Worcester, enlisted in the Worcestershire Regiment at Malvern on the 23rd October 1905, to serve 9 years with the Colours and 3 years on the army reserve. He was posted to the 1st Battalion five days later. 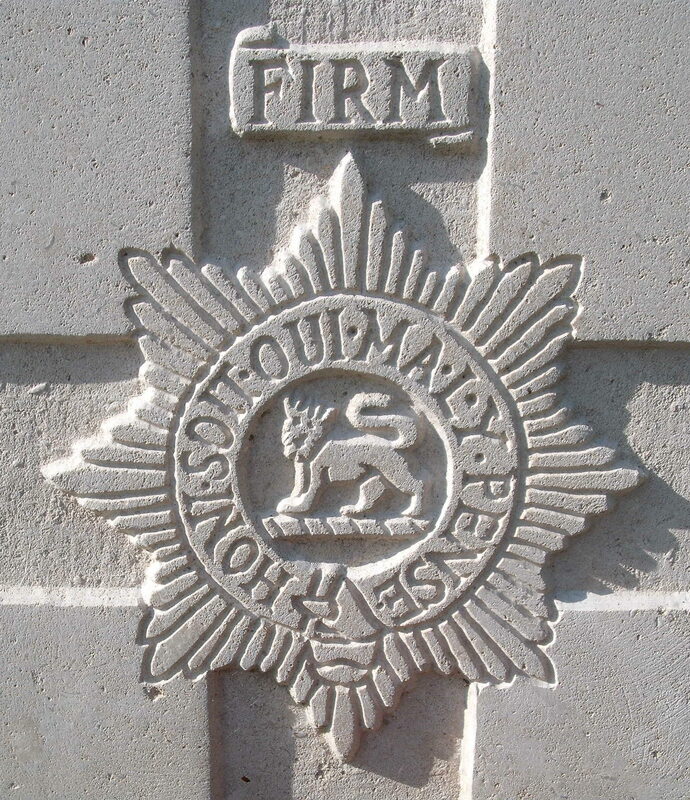 He was transferred early to the Army Reserve on 11th November 1911 and worked for Messrs Jones and Davis in Malvern. He was mobilised on 5th August 1914 at the outbreak of the First World War and was posted to the 5th (Militia) Battalion for training. On 30th August he landed in France and was posted to the 2nd Battalion. William Morris was killed during the Worcestershire Regiment’s must famous action of the First World War. During the First Battle of Ypres the German army were about to break through the line at Gheluvelt – if they succeeded they could encircle the small British army, capture Ypres and possibly put Britain out of the war. The 2nd Worcestershire, who were the only reserve left were called upon to ‘plug the gap’ and rushed the advancing German with the bayonet. They were successful in halting the advance, and suffered remarkably few casualties bearing in mind the determination of the enemy. They promptly sent a carton and received a postcard of thanks. The news of his death did not reach his parents at Fairlea Terrace until Christmas Eve 1914. The Union Flag at his old school, Cowleigh Mixed School, was hoisted to half mast in his memory – this was a tradition that was to be repeated whenever an old boy was killed in the war. At Christmas 1915, Princess Mary sent a brass gift tin, filled with chocolate and cigarettes to those men serving in the forces at the time. Touchingly this gift was also sent to the next of kin of those who had already been killed. William Morris’s father acknowledged receipt of this gift shortly in March 1915. His brother, also a soldier in a regular unit, the South Wales Borderers was wounded during the siege of the German colony Tsiang-Tau. In January 1915 he returned to Malvern and related some of his experiences in South Africa and China and the capture of the colony to the school children at Cowleigh.